Saturday, October 16, 2010: After a restful night we woke to partly cloudy skies with temperatures in the mid 40’s. As Kit prepared breakfast I walked around the Birch Point Campground facility. We were the only campers in the place although a few of their cabins were occupied. As Kathy mentioned we had camped here about 25 years ago when we met up with a group of Navy folks and in fact a few of them we are still in contact with. I found the campsite we occupied back then and it still basically looked the same. The owner is a local guy and has owned the campground for many years. His goal is to keep the place friendly, the prices low and the facility rustic…..all benefits in my book. Speaking of prices, he said to just settle up when we pulled out and at this time of the year he only charges $20.00 a night. Now that is a bargain! After an enjoyable breakfast, where I learned the phrase Mon nez est formé comme un beignet de gelée, we decided to head out and explore the border town of Houlton. Of course we decided to take the back road and of course it was dirt, and of course it was muddy. But at least we weren’t dragging the trailer along and we did enjoy the beautiful countryside. 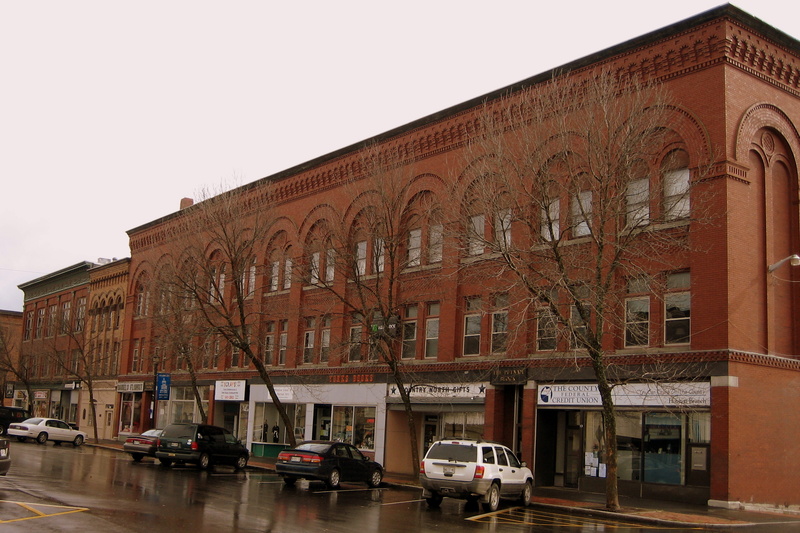 Arriving in Houlton we parked in the downtown area called Market Square. The buildings are mostly brick with ornate and complicated work around the windows and along the roofline. The story goes that the big city of Bangor to the south had hired a talented group of brick masons from Italy to build their municipal buildings. Well the little town of Houlton got wind of it and enticed the brick artists to stop by on their way back home and construct some buildings for them as well. 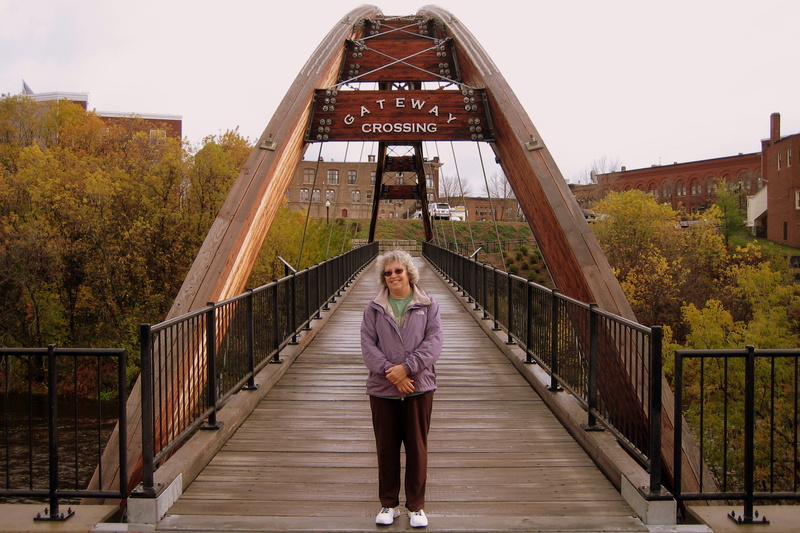 After some shopping we explored the Gateway Crossing bridge and riverfront park. 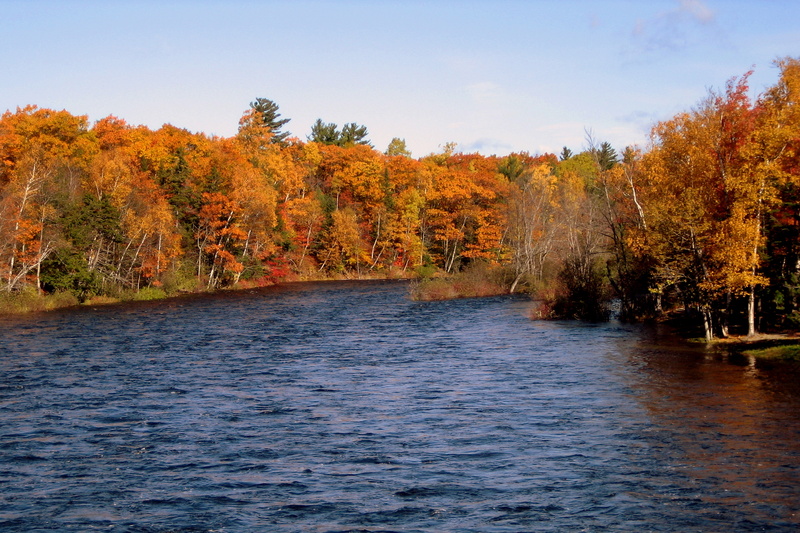 The bridge spans the Meduxnekeag River which was named by the Wabanaki Indians and means “The Place Where Our Moccasins Wear Out”. 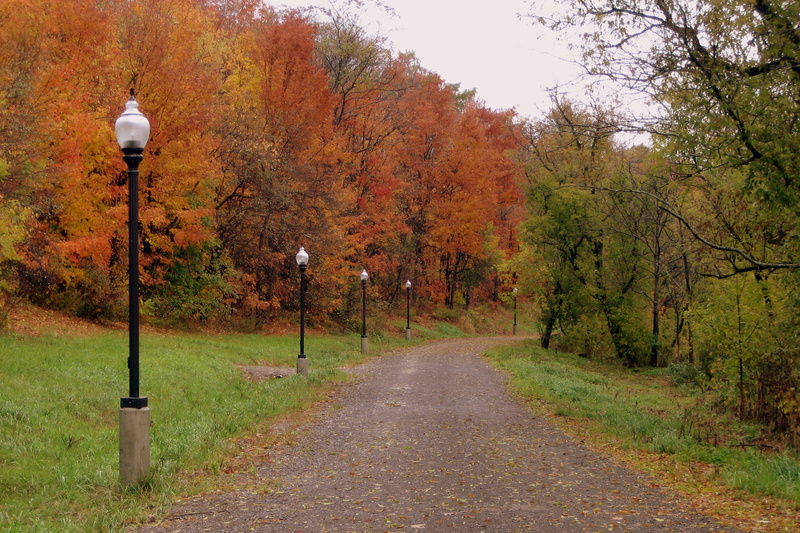 The park has a lighted trail that leads down stream enhancing access to the river and allowing further exploration of this beautiful area. K it and I were fortunate to happen upon a moose and the mighty beast was kind enough to stand around while we snapped a few pictures. Leaving Houlton we headed north up US-1 through the towns of Mars Hill, Fort Fairfield, and Presque Isle. Along the way we noticed a large Border Patrol station which is pretty typical for an area so close to a foreign country. However there was a dozen of the ubiquitous white and green border patrol SUV’s in the parking lot. I guess they will be ready if those illegal’s from Mexico figure out how to sneak into Atlantic Canada by way of the Atlantic Ocean. When I was in the Navy I had an office in Presque Isle and it appeared the town had changed very little in the past 25 years. We walked the three block downtown area stopping in a few shops. I also peeked into the Northeastland Hotel where I used to stay and found it a bit fancier than I remember. Nearing “grey hair dinner time” (about 1500) we stopped for an enjoyable meal at The Governor’s Restaurant. No, not Mama Baldacci’s…..that’s in Bangor. 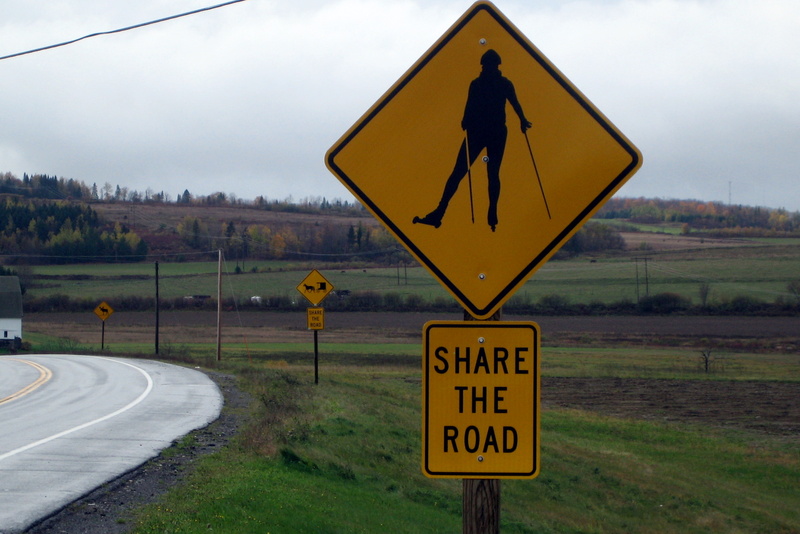 North of Presque Isle we came across this rather unusual road sign. As a way of explanation an Olympic Biathlete Training Center is near by. Yep, those are wheels on the tip and tails of those skies. Gotta train all year long and the month of July and August has some pretty poor snow conditions. Returning to Birch Point we retired early in order to make a morning Alpine Start for a long anticipated trek to the North Country. 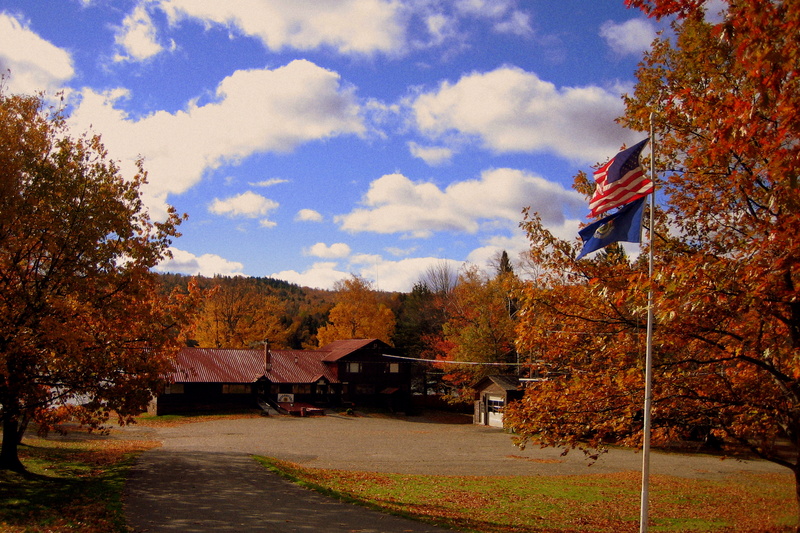 Sunday, October 17, 2010: Departed at 0900 and jumped on ME-159 through Patten, Shin Pond Village, T6R6, and on into Matagamon where we entered the northern Gate to Baxter State Park. So what’s T6R6? Well it’s the geographic position of an area based on a north/south, east west, grid system. This numbering convention is used throughout the US but most areas have developed names for the various counties and towns that reside in the designated area. However in Maine a lot of areas are unincorporated and largely unpopulated so no one bothered. There are many T#R# areas identified on maps of northern Maine. 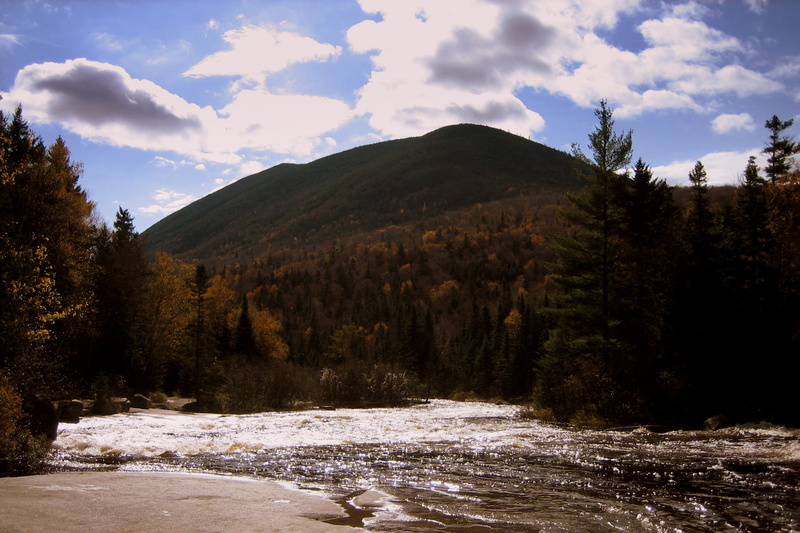 Baxter State Park is a unique wilderness area and one of the favorite places of Maine people. It was founded when a former governor, Percival Baxter, systematically bought up parcels from loggers and Indian tribes during the middle part of the last century. A total of 314 square miles were then deeded to the people of Maine to remain for their enjoyment. The park is managed by an entity separated from the federal, state and local governmental control. Percival Baxter further decreed that this new park would remain basically forever wild with minimal human fiddling. 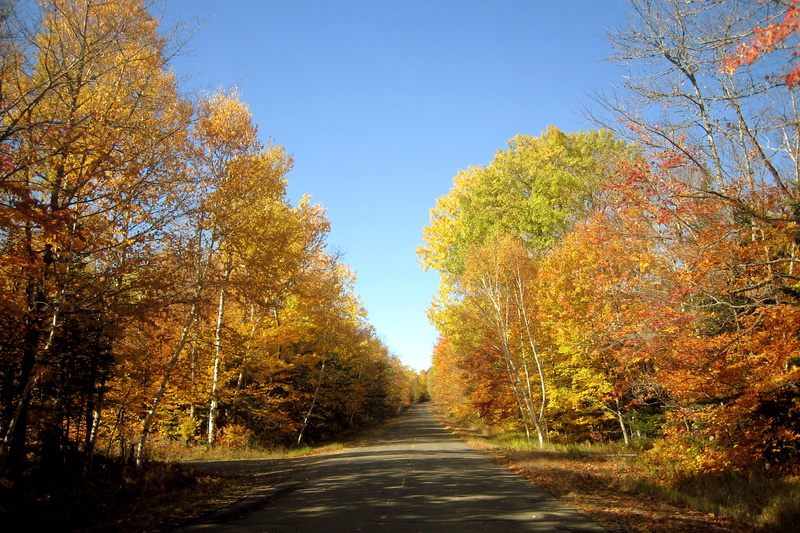 The tote road that connects the northern part of the park with the more visited southern part is a sixty mile one lane dirt strip with a speed limit of 20 MPH. Less than 6 miles from the Matagamon Gate we rounded a bend and came face to face with a pair of moose. The cow sauntered a short way into the woods but the bull stood it’s ground as I slowed to a stop and grabbed my camera. The standoff lasted for a number of minutes before the fella apparently got bored and went into the woods as well. 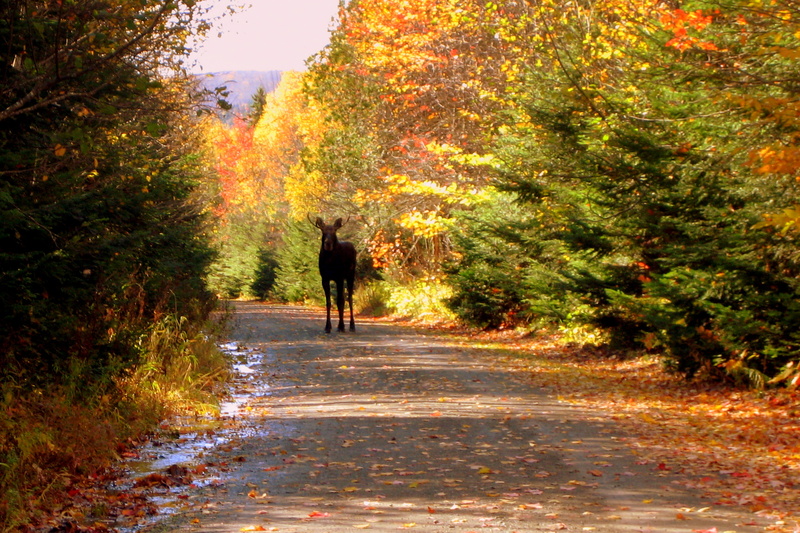 It’s always exciting to see wildlife in northern Maine but spotting a moose is the ultimate thrill. Oh by the way, Kit corrected me…..I guess the proper pronunciation is “a pair of Meese”. 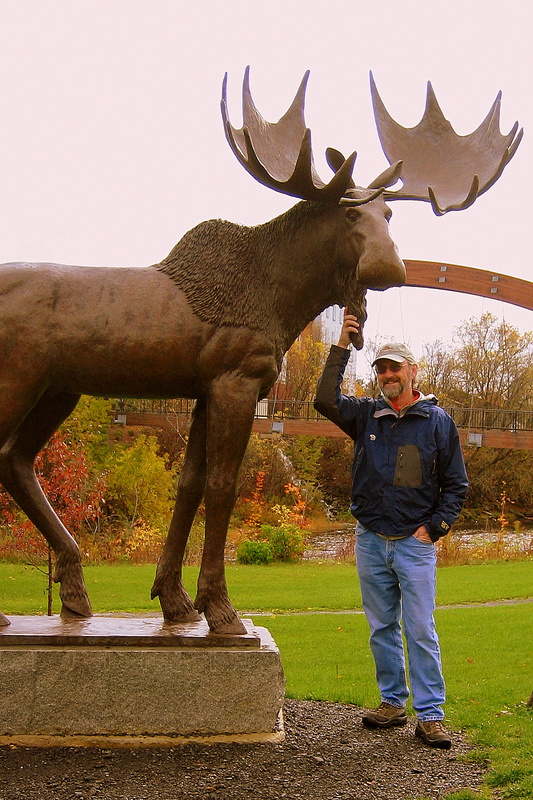 Coincidentally our friend Dave was in a different part of northern Maine today and due to his superior scouting and photography skills was able to capture the moose photo’s that are now posted on his website: www.davewhitewildlife.blogspot.com. Check them out! We stopped at Ledge Falls to stretch our legs and enjoy the view. 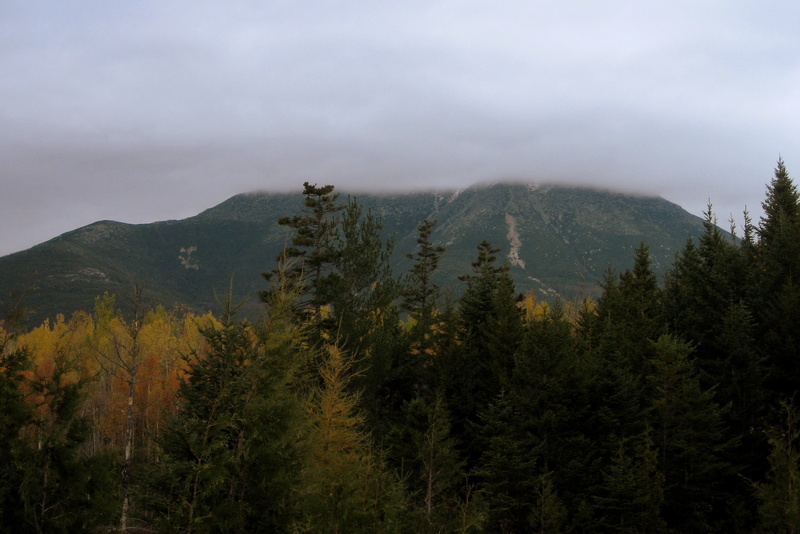 The skies were clouding up and I was concerned that when we neared Mount Kathadin the tallest mountain in Maine would be obscured. 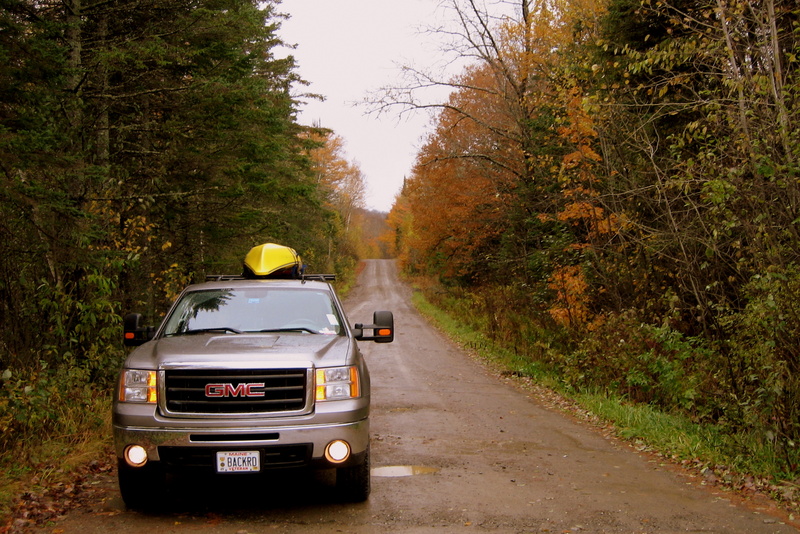 Pulling into Stump Pond (can you guess why it’s called that?) we took the short hike to the pond where traditionally I have had a good view of the mountain. Not today! According to the ranger there is snow at the summit and all trails leading to the peak are closed due to snow and ice. Baxter Peak at 5,268 feet is the highest point on Mount Kathadin and the northern terminus for the 2,180 mile Appalachian Trail. Any north bound through hikers still out there are gonna be pretty upset. 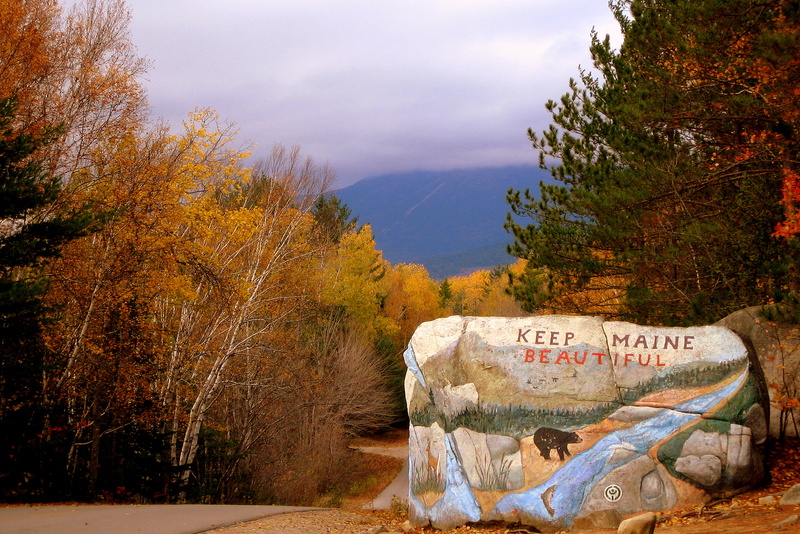 Speaking of AT through hikers there is a camping area reserved just for them within the park and the Baxter State Park Authority prides itself in never turning away an AT through hiker as they near the end of their six month long hike. After a very enjoyable and relaxing 6 hours exploring this Maine jewel we exited the park by the southern Togue Pond gate. Looking out the back window we could still see that the summit was hidden in the clouds. Traveling south on the Golden Road we made our way into the paper mill town of Millinocket. 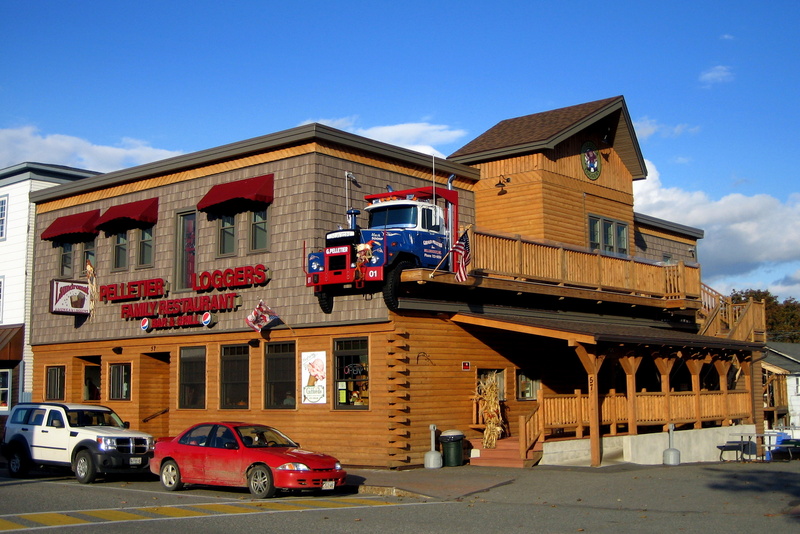 Since it was near dinner time we decided to eat at the new place in town called Pelletier Loggers Family Restaurant. The Pelletier brothers have been a fixture in the Maine woods for many years, cutting trees and hauling logs for the local paper industry. About three years ago the TV folks from Discovery Channel contacted the brothers about making a reality show called American Loggers. Well the show was a hit and the brothers decided to put their new found income into a very nice restaurant. 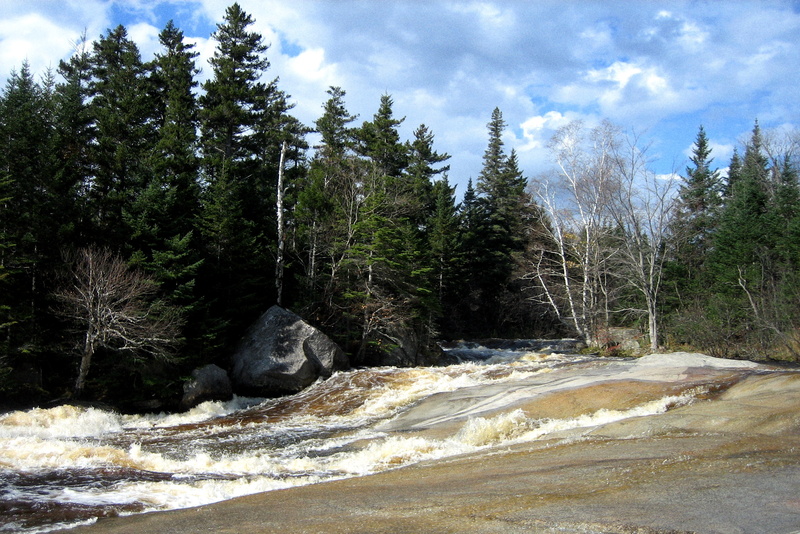 Monday, October 18, 2010: Left Island Falls around 1100 and made our way south. 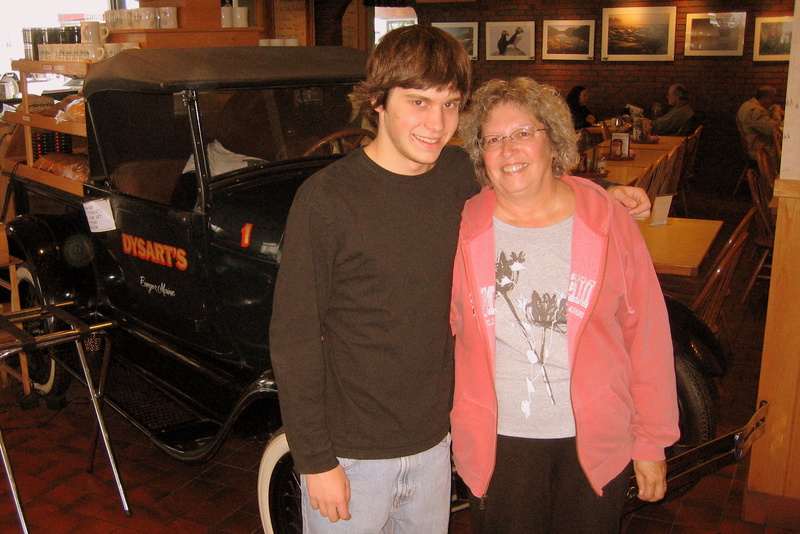 We had a lunch engagement with our oldest grandson who is a freshman at the University of Maine in Orono. He intelligently chose to meet up with us at Dysarts south of Bangor. 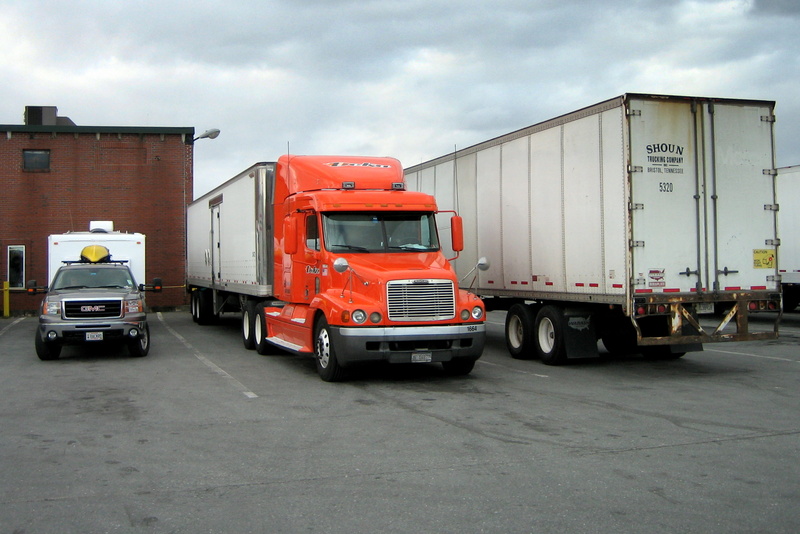 Since it is a truck stop there was plenty of room for our truck and trailer but our poor rig did feel a bit intimidated by the big boys. We had a great meal and of course, a great time catching up with Joe and his activities at Orono. He is a fine young man and has a very mature attitude about college and his future. And, by the way, he recently completed all his requirements for the Boy Scout Eagle Rank! We are equally proud of our other four grandchildren as well and intend to brag on them in a future journal. We arrived home around 1900 and backed the trailer into the driveway. After we take care of a few cleaning chores and buy some tires we will put the RV to bed until January 2011. My favorite blog posting of this trip. Loved the bit about Millinocket and Baxter. Especially the mooses piece. Glad you had a safe trip and are back home. Always love the pics!! So beautiful! More memories…Sterlin was born in Mars Hill, still has many relatives there, and we’ve spent a lot of time there over the years. Pelletiers’ Restaurant is a favorite of my nephew, Alex, who does a lot of work in the area. We love Baxter Park, and I worked with a Psych. nurse at Regional who was married on the AT (but not in Maine) and her wedding was included in a National Geographics book about the AT. Her name was Cara but I can’t remember her last name. Should have continued to Fort Kent and gone to say Hello to my family, they would have loved to see you. 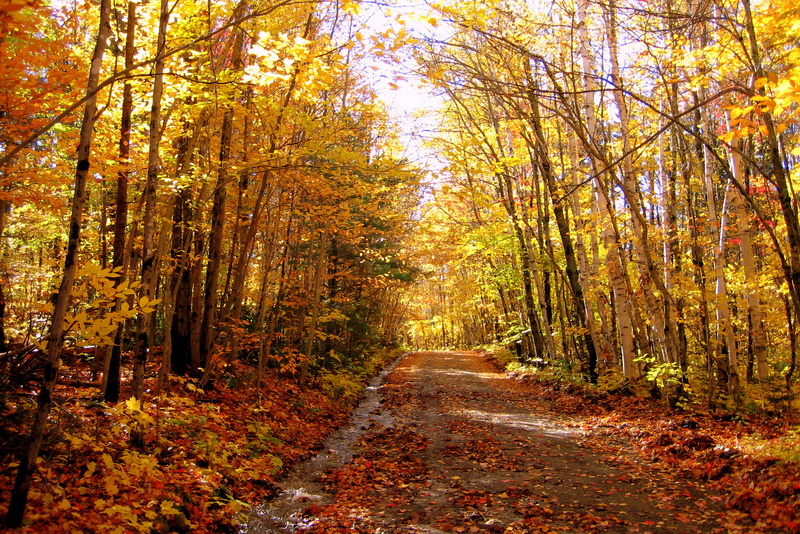 Northern Maine is beautiful especially this time of year. Hi, Maybe we’ve missed transmission but #7 was the last we’ve heard from you. Hope all’s well and their are other “Grams” on the website! Leaves continue to fall and temps are close behind. If rain days would not come every 2nd day we could get the job of cleaning completed. Hope to have it done before Thanksgiving….don’t want to have any leaves in the Turkey gravey! Doing fine here…keep your messages coming when the ink in the pen flows!